Blackcliff Academy lies at the crux of the story. It is the training ground of the Masks, a sinister force in the book, and one that must be infiltrated. I won’t go further (so no spoilers), but the different locations in the academy are quite important – as is the secret stairway. 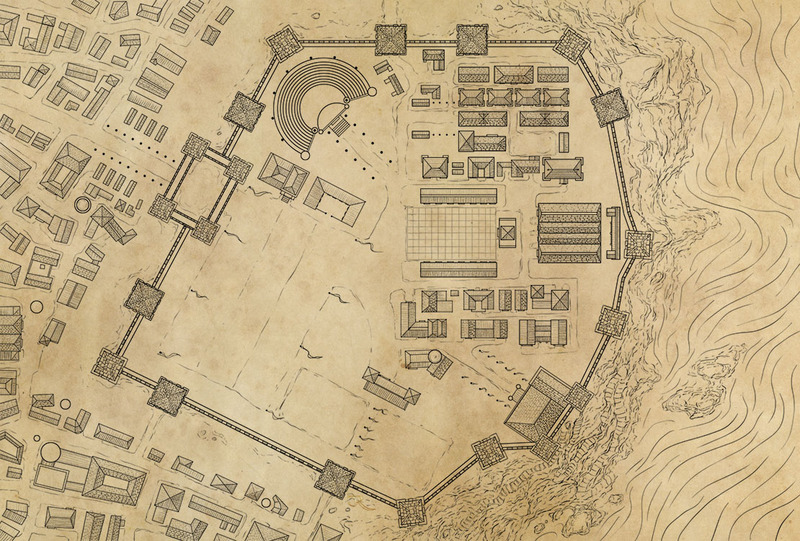 As with all maps, the commission began with a sketched out map (thanks Sabaa – you sketch beautifully clear maps), and a few pages of text describing the locations. From this – the first order of the day was to sketch out the map quickly. This allows me to identify any problems (what style should the buildings have, note buildings no-one can access, that sort of thing). It also provides a clear layout for the editor and author to review and sign off on. Many lines here are very quick – note the houses around the keep have been dashed off. But all the features are there. I try to make as few design changes between this version and the final – even if it’s the layout of a non-featured building. That means no-one gets surprised. The academy buildings are more carefully detailed, as they are key to the plot. I also added careful detail into the two paths running down the cliff over the desert. They are key to the plot, and needed to be represented just right. I work on a white background for most sketch maps. I went with a light grey here because there’s a lot of elevation detail to this map. I needed some tone in the sketch to indicate the elevation of the eponymous blackcliff. It’s easier to add tone when you start with grey, rather than shading into a white base. I received sign off on the sketch, so it was time to get on with the lines. Unlike world maps, where nothing is straight, city maps are all straight lines and rigid corners. I began by outlining every building and wall. The hard edges, and precise circles, give the order to the map. 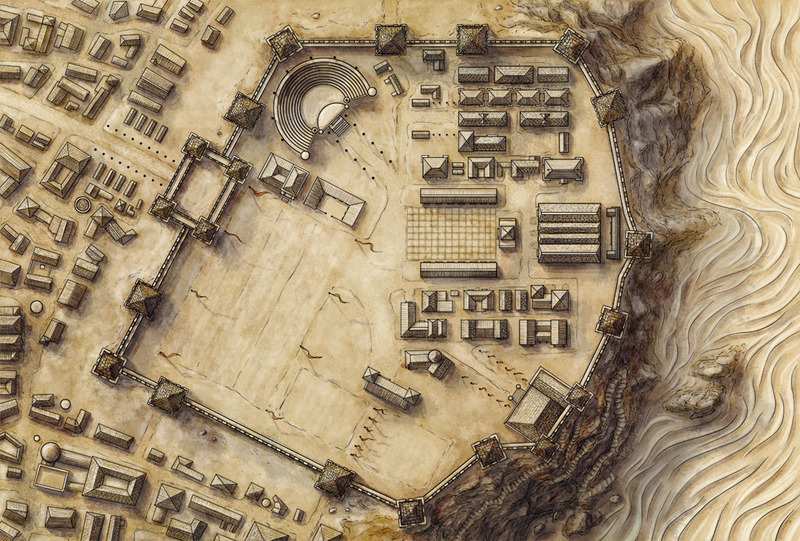 And the Martials are very ordered – this is a military establishment of training and parade grounds. In contrast, the cliff and desert are undulating and organic. It’s as if the Academy stands as a bastion against the flexibility of nature. Once the outlines were in place, it was time to add the details. In this map – that means lots and lots of tiles. I drew every tile on every roof. Some people use brushes and textures for this – but that kind of repetitive pattern is hard for the human eye to ignore. I want the map to imply the order of the Martials, but not to look like it was drawn by a 21st century urban planner in AutoCad. The tile detail also allowed me to add some form to the map. Notice that the tiles on the lower right facing roofs of the buildings are drawn with a heavier line weight. This gives the buildings 3D form even at the line art stage, which means I need to do less work with the shading when I add tone to the map. I also use heavier line weighting for the Academy, especially the walls. 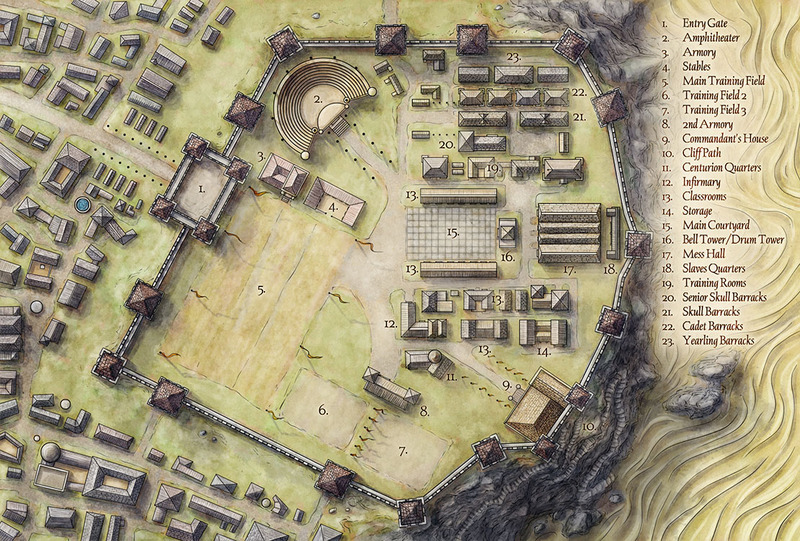 I want the military buildings to dominate the map – and the broader town to take secondary billing. The line weight helps to reinforce this hierarchy. 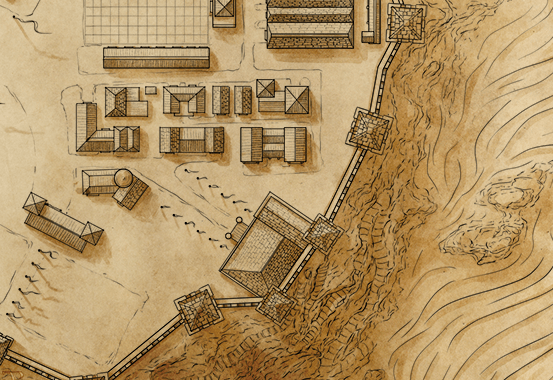 Finally, I drop in a mid-tone parchment background to act as my base for the next stage. 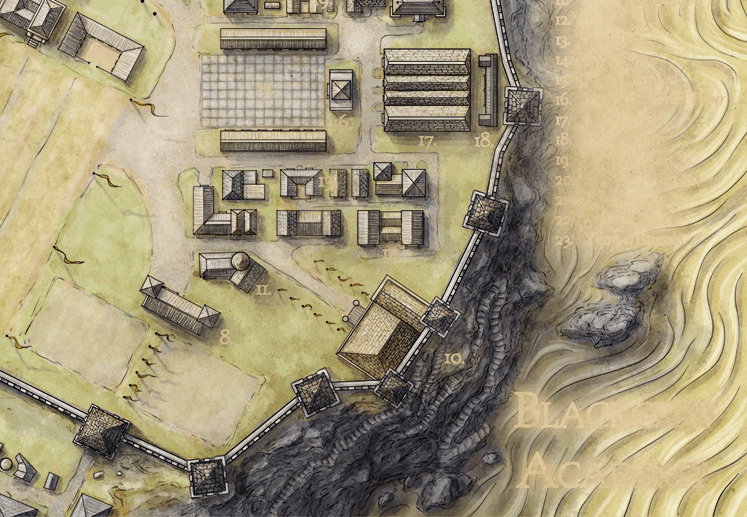 The Blackcliff Academy map is all about elevations – and right now the map looks very flat. That’s easily remedied – we need to add shadows and highlights to the map. I add light and shade through a series of layers. First I begin with a simple overlay layer, and hard round brush with variable opacity. I block in major shadows. In a city the shadows are cast by buildings, and buildings have a lot of straight lines. So the shadows should have hard edges. But rough ground, diffraction, and a ton of other reasons mean that shadows are never hard and precise. So I freehand the shadows in quickly. This gives a quick form to the map, and allows us to see where we are. Notice that the buildings all cast shadows in the same direction, but you can still see the individual brush strokes. The flag poles also have clear and distinctive cast shadows – those really help sell the three dimensional nature of the map. Finally the cliffs are almost all deep shadow here – remember this is Blackcliff. But a couple of ledges that might catch the sun are left un-shaded. For the dunes, I use a simple flowing line. There’s not a lot to be done there, but this gives them some quick shape. Shadows aren’t just darker than their surroundings – they’re also less saturated. This means that shadows tend to be more towards the blue end of the spectrum. It’s an old piece of colour theory that bluer colours read to the eye as if they are further away. Check out Cezanne’s Boy in a Red Waistcoat – the shadows on the waistcoat are actually blue. Unfortunately in Photoshop, the overlay blend mode tends to bump up the saturation of the background – and my background has a lot of reds and oranges in it, so the shadows appear unfortunately vibrant. That’s quickly fixed, by adding a colour layer, and using a desaturated blue to pull back the shadows. Note the difference. I’ve not made anything darker in this image – I’ve just changed the colour of the shadows. Note that I’ve also desaturated the desert dunes. That might seem odd – dunes are yellow. But I’m borrowing Cezanne’s trick. Desaturating them a little pushes them into the background. They’re on a lower elevation, so they are literally further from the viewer. I want to use every chance to sell the fact that the Academy is on top of the cliff, and the dunes are at the bottom. Finally – we add detailed light and shade. At this stage we deepen the darkest shadows – and Blackcliff Academy has some very dark shadows – and use bright highlights to pick out details that we want to draw the eye. The starkest contrasts are on the roofs. The brighest highlights are along the crests, directly beside the shadows. This crisp definition pulls the eye in – forcing you to look at the main feature of the map. The walkways on the walls contrast with the shadows between the crenellations – adding a pattern that again draws the eye. At this stage I also add some rough lights and darks to the ground. The parade grounds and patches of grass aren’t perfectly flat, so they should not have a uniform tone. Finally -I make sure that the steps down the cliff are lighter than the rest of the cliff. That obviously has no physical reason – they’re in the same shade as the rest of the cliff – but the contrast brings them to the fore. They’re an important element, so we won’t let a simple thing like physical reality allow them to be overlooked. In this case, colour is a bit of a misnomer. The key to Blackcliff is just that – it’s black and grey. So at the colouring stage what we’re mostly doing is taking that lovely rich paper background, and taking away the colour. Here the cliffs become a desaturated granite grey – as do the walls. I cheated a little on the Academy itself, adding a touch of green for the grass, and a variety of desaturated browns and reds for the roofs. The towers all get a rusty red pan-tile, and there’s a single splash of blue for the well in the city outside the academy gates. This is also the point at which the desert gets it’s brighter yellows, to contrast with the city. This is all done using two colour layers. One for the roofs – which need to be precise. Another for everything else – that can be less precise. The roof layer sits above the everything else layer, so those colours supersede anything on the layer below. The last step of any map for me is the labeling. A map is only useful if you can read it – and that means knowing what everything is. But how do you add detail at the last minute without it fighting with all that detail you’ve carefully illustrated? The answer is that you take an eraser to what you’ve done. 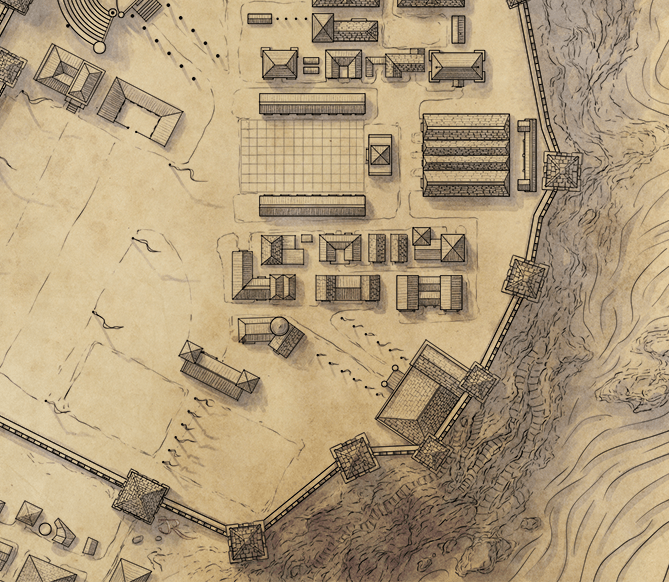 Here’s the map without the text layer. You can see where all the lettering is – because I’ve pre-erased all the places where the text will go, as well as a halo around it. I’ve done this to the colour, shade, and line art layers individually. This means that the text itself appears, it’s got room around it so it’s not competing with all that detail. I don’t erase all this by hand (of course). Copy editors change text all the time – and maps need to get translated into other languages. I expect text to change – so I use Photoshop’s layer masks. I add all my line art layers into one folder of layers, the colour and shade into another. Then I can add a mask to the group of layers to produce the effect above. When the text changes, I just need to tweak the layer mask and all is well. 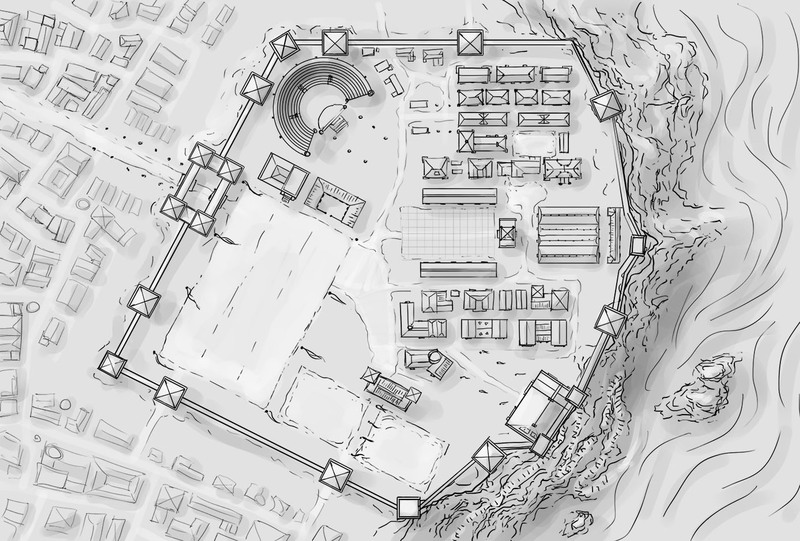 With that done, we can add the text in, and we have the final map of Blackcliff Military Academy – all ready to be at the heart of the mystery and intrigue of Sabaa Tahir’s award winning debut, An Ember in the Ashes. 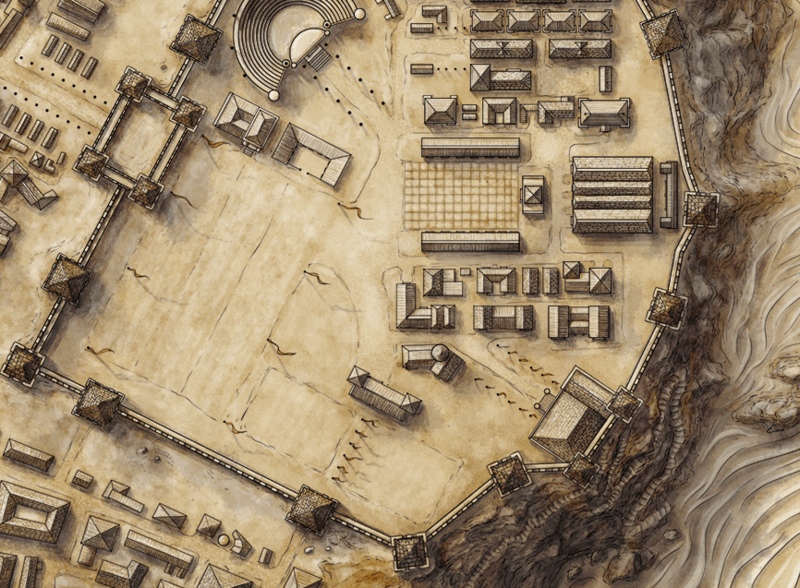 If you’d like to make maps like this yourself – this is very close to the process I use in my tutorial on illustrating your own map from scratch. Please keep it up. Your maps are inspiring. Thank you. I just discovered your site a few days ago, and because of your tutorials I will likely be purchasing a tablet soon in order to better my map making for my Pathfinder campaigns. Alright, cool! I’ll do that. Wait. Where do I do that? I don’t see a link to Amazon anywhere. If you go to my recommended tools page – click one of the links there. That’ll take you to Amazon. Really inspiring! I’ve tried my hand at making maps and they felt functional but meh. Your tips will have me go back to them and see if I can improve them to look better. Thanks! I can’t seem to get my lines so smooth and clean. I don’t know why, but none of the brushes I try seem to have that effect. Any tips? Fantastic article, thank you so much for helping out us folk new to map making.